I slowly tiptoed to where the sparkle was coming from, and it was the most unobstructed view of the Petronas Twin Towers. I stared at it like it was the first time. It was two in the morning and we just had our super late dinner. 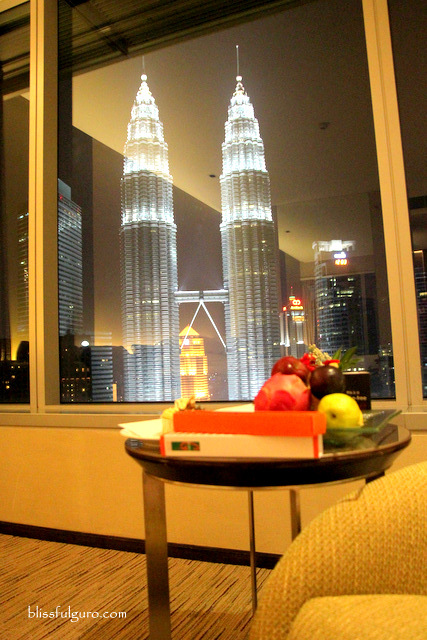 My eyes were glued at this great marvel as I sat on the carpeted floor of our home in KL, the Traders Hotel Kuala Lumpur. We just had a quick stopover at the UNESCO World Heritage City of Melaka and will be spending three days in Kuala Lumpur before we head out to our next destination in our two-month backpacking trip around Southeast Asia. It’ll just be a snap; this KL trip will be all about our fave noodle dish in the world, Mee Goreng (hooray! ), or so I thought. And because we pretty much knew KL by heart by now, we sped our way from the bus station to the train station to get to Bukit Bintang to hop on the free GO KL bus going to the KLCC, whew. It took us an hour before we arrived at our home; it was eleven in the evening. This has to be the latest check-in we had ever, but the most fun. 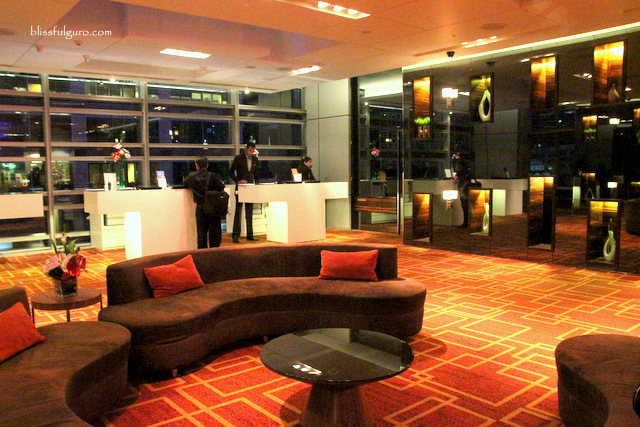 It was almost midnight and the lobby of the Traders Hotel was empty. We were led to the fifth floor where the formal lobby was located. We were assisted by a front desk officer who seemed to know me personally. He’s like, So how’s your day Ms. Carla, which I gladly replied with our lovely stories from Melaka. And then, as if on cue, he handed our key cards and briefed us on this and that and so on with so much gusto, he had this early-morning-energy at midnight (bad thingtoo bad, I didn’t get to take note of his name). Moving on, we booked for a Traders Club Twin Towers View Room. We were assigned on the 31st floor which, I must say, is the best room with a view we ever had (check room types and rates). I hurriedly went to where happiness was; the glass windows. 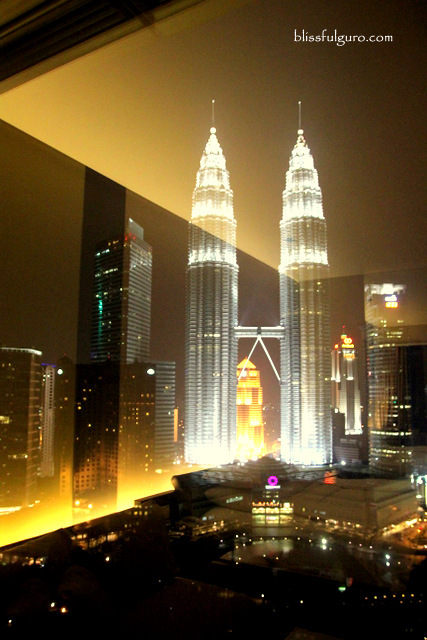 It was midnight, and the Petronas Twin Towers was sparkling with all its glory. And it was beautiful. I’ve been here lots of times but this was definitely the first time that I truly appreciated it. Oh, I almost forgot about how great our room was. The 32 sqm. Traders Club Twin Towers View Room was well-furnished with a huge comfy bed, LCD TV with local and international channels, couch by the window, full-size executive writing desk, mini-bar, coffee and tea-making facilities, closet with bath robe, electronic safe and portable iron station, and the best of all, unobstructed view of Kuala Lumpur’s (or Malaysia's) greatest icon. We took some photos of the room and immediately updated our social media accounts with the help of the complimentary WiFi connection which was very reliable and fast. And I almost forgot to check out the bathroom. The spacious en suite toilet and bath was brilliant. 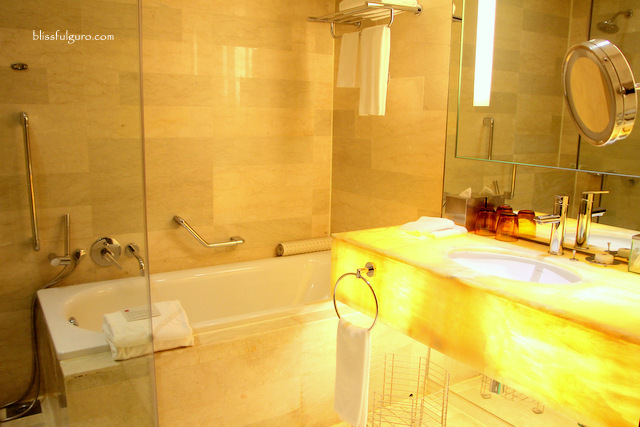 The separate shower area and bath tub were lovely (I hate it when some hotels use the bath tub as the shower area). The bathroom counter was so unique with its glowing light from underneath that has the essential toiletries that were all provided for. The magnified vanity mirror, hair dryer and digital weighing scale were women’s dream come true. The bed was also comfy with the fluffy pillows. You know that feeling when you jump into your bed and your body involuntarily surrenders and molds to your perfect sleeping position; that was my perfect sleep at Traders Hotel’s relaxing bed. 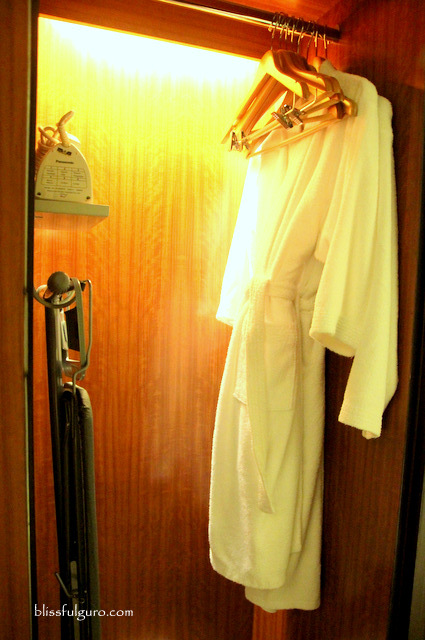 We also enjoyed the privileges of staying at a Traders Club room. One of which was that we got to enjoy the Traders Lounge’s perks of complimentary beverage all throughout the day and free breakfast, afternoon tea and evening cocktails at the lounge. 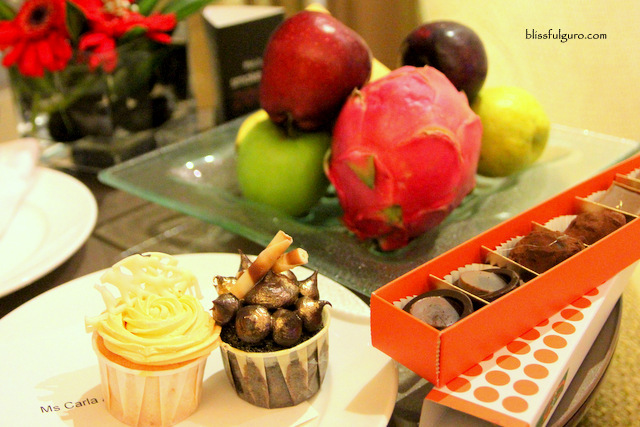 We also had chocolates, candies and fresh fruits on the small dining table in our room. I woke up the next morning feeling great. I rolled out of my bed, said my morning greetings to the twin towers and awakened my buddy who seemed to be enjoying his time in dreamland. 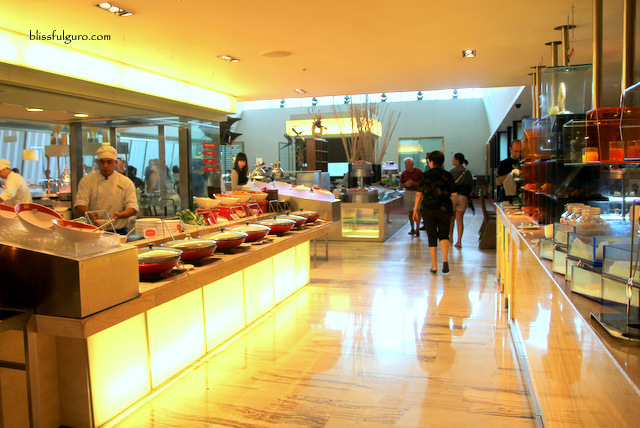 We went down at the 5th floor to the Gobo Chit Chat Restaurant for the complimentary buffet breakfast. The huge restaurant was packed with guests that were enjoying the morning feast. 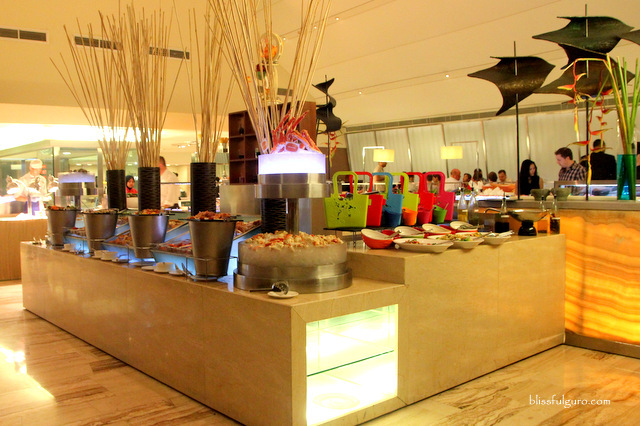 The buffet spread was an assortment of local and international breakfast fares. It was quite noticeable that the food selections were Halal certified. My plate overflowed with sausages and freshly made roti (with curry dip). My buddy, of course, emptied the Mee Goreng station. I also loved their fresh orange juice maker. 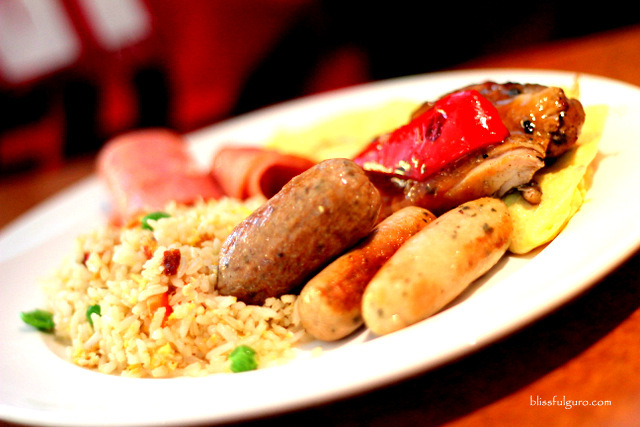 We initially planned to go to Jalan Alor and Chinatown in Kuala Lumpur but were dragged back to bed for an unplanned siesta which lasted for hours. It was the perfect relaxation we needed. Waking up with a nice view of the twin towers was becoming a routine for us. 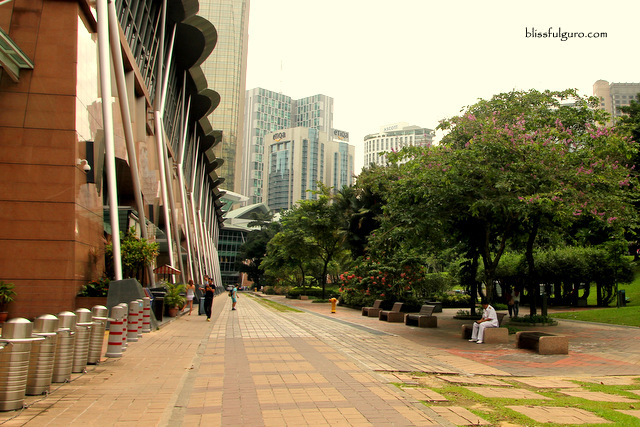 We did some walking around the KLCC Park around the Petronas Twin Towers (a good 10-min. walk from the hotel) for a little stretching. We went back to the hotel at around six in the afternoon for some cocktails at the SkyBar. 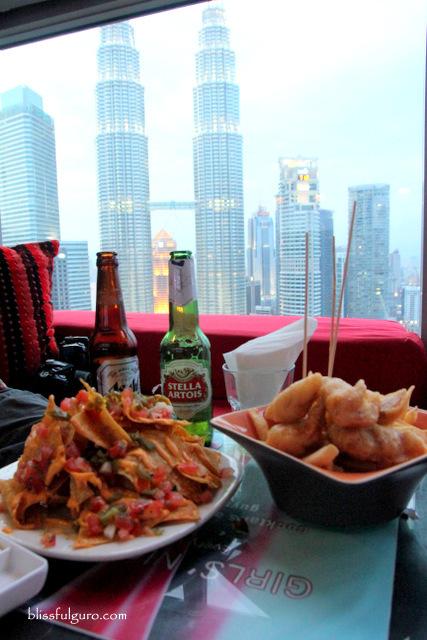 The award-winning SkyBar is one of the most popular rooftop bars in Kuala Lumpur. And why not, various DJs perform there nightly and the unique bar, with full glass ceiling and windows, features a variety of drinks, cocktails and bar chows. 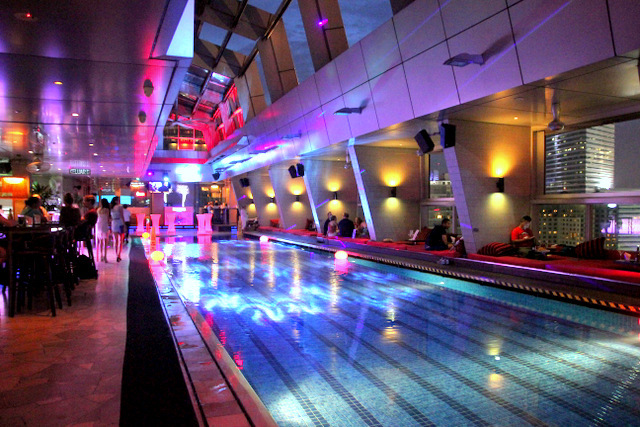 Plus, the swimming pool in the middle is always the focal point for parties. 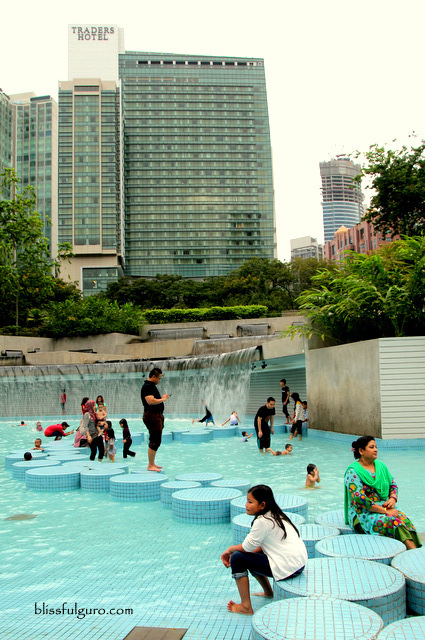 The amazing view of the Petronas Twin Towers made us rush to the cabana booths. We consumed a few bottles of beer and munched on some overloaded nachos. 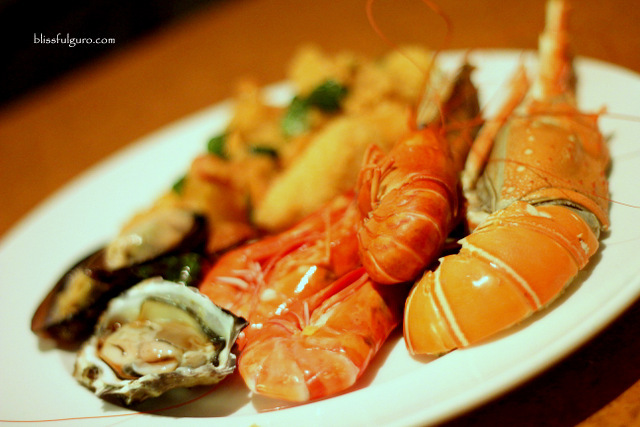 At around eight in the evening, we left the party scene and proceeded at Gobo Chit Chat Restaurant for the nightly buffet dinner. 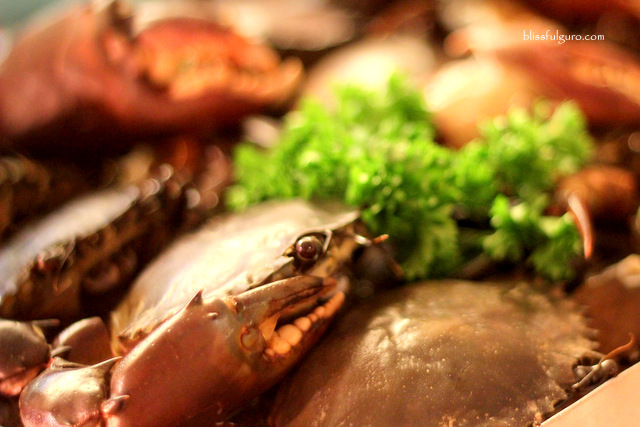 Every night has a different theme; Monday – Crabs, Tuesday – Carvery, Wednesday – Noodles, Thursday – Barbecue, and Friday | Saturday – Seafood. We were there on a Saturday, and it was Seafood night. Yey! 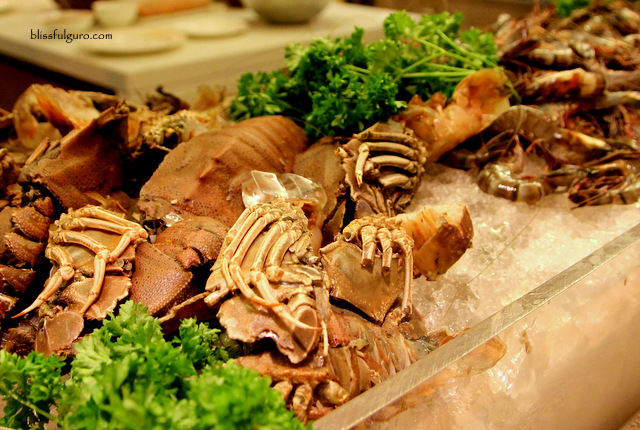 We went back and forth to the crustacean section where we overindulged with fresh prawns, lobsters and scallops; food coma afterwards. 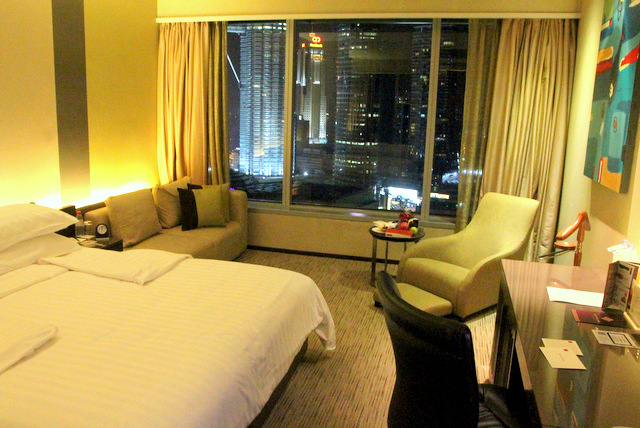 We both agreed to spend our last night in KL at the comforts of our room. 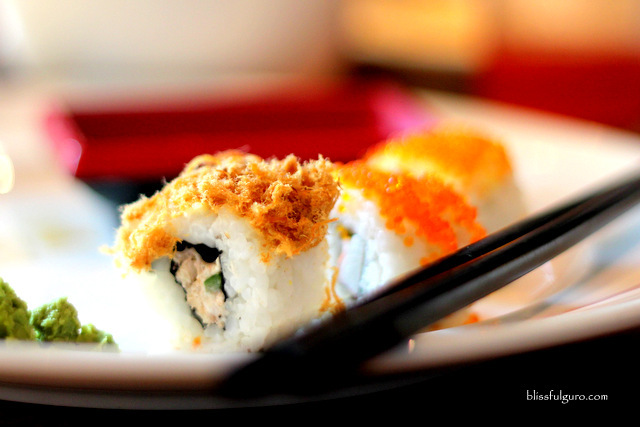 We were nursing our full tummies as we gazed on the amazing view from our window; it didn’t fail to amaze us, every time. We needed to get up early (like five in the morning) to catch our early flight to Myanmar. 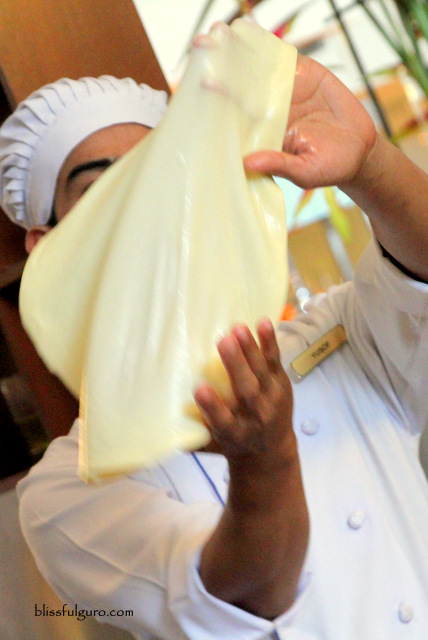 We called up the room service to check if they could probably pack some take away breakfast sets for us. And it was better than we expected. They gave us a door menu in which we ticked our preferred brekkie plates the next morning. 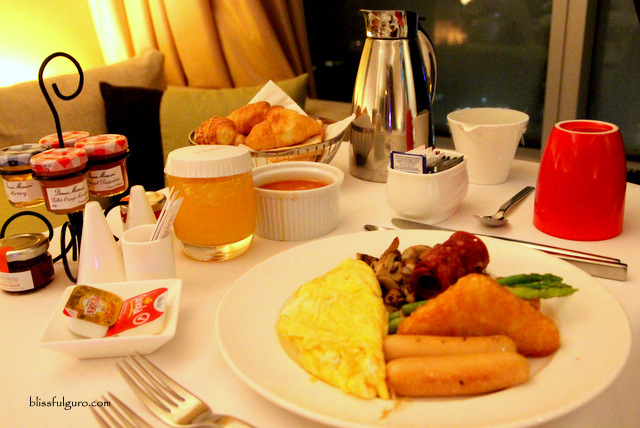 At four in the morning, they served the breakfast sets in our room. And it was great! 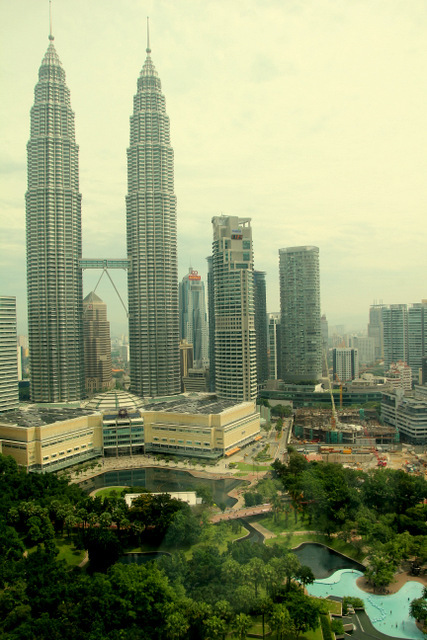 We’ve been to Kuala Lumpur a dozen of times, but haven’t been to the famous sights besides the Petronas Twin Towers. This time, we didn’t leave our hotel room but were given the best view of the greatest Malaysian icon. I’m in love.